In our experience, many of the scholars amongst us were not fully knowledgeable about the optimal way of performing Hajj and found legal ‘loop holes’ in order to make things easier. These ‘loop holes’ or ‘easy ways out’ don’t necessarily invalidate the Hajj experience but what it does is that it takes the blessings and optimal rewards away from one’s experience. The object of Hajj is to be on our best behavior with humility and patience and to do as our Prophet (pbuh) taught us to do. Since we had conflicting scholars amongst us in our group we chose to stick close to our sister Alia who had studied the Hajj and had compiled a book consisting of all of the rites for Hajj that only adhered to the exact footsteps of Prophet Muhammad (pbuh). Despite the fact that the Sunnah way is a bit more challenging and difficult, somehow miraculously we had noticed that God had opened up our path and made things easier for us. At times it seemed impossible to maneuver with ease whilst amongst 4 million other pilgrims, but truly by the blessings of our Prophet’s (pbuh) teachings and guidance, things became easy and paths opened up. In addition to the ease that we experienced after the difficulty we were also rewarded with angelic people around us who not only took care of us but also became our friends. We had the pleasure of meeting a direct descendent of our Prophet (pbuh) who was one of our scholars who had lead us in the way our Prophet(pbuh) would have performed Hajj. We had such an amazing experience learning from him that it seemed that the entire experience was to receive the gift of this beautiful soul in our lives. It really does boil down to having that belief in our Teacher (pbuh) and having complete faith in God’s (Allah’s) will. As Muslims, I feel this is a reminder to not only follow God’s instructions and commandments but to follow them in the way that our Prophet did for the optimal benefits for ourselves. It should be no surprise for us why God Chose Muhammad (pbuh) after all he was His most beloved Messenger. I really feel that the Muslims and Non-Muslims who do not know or do not follow Prophet Muhammad are at a loss. According to the Quran, Muhammad was sent to us in order to teach us the Oneness of God and this was for all of humanity and for all times. Other Prophets like Moses, Jesus, Joseph, Abraham, Noah and David etc. were all sent to spread God’s message but they were limited only to their own nations. Prophet Muhammad (pbuh) was sent to guide all of mankind for eternity. He must be studied and he must be followed it can only bring goodness and tremendous blessings. 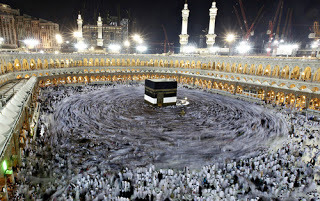 This entry was posted in Uncategorized and tagged Dhul Hijjah, Hajj 2012, Hajj 2013, Hajj according to Muhammad pbuh, our Hajj, The Hajj, the journey of a lifetime, The Muslim Pilgrimage, The sunnah Hajj. Bookmark the permalink.